If until now it seemed that the history of karting has already been well described and there is a solid foundation to be passed on from generation to generation, then with today it is quite clear that this season will write new pages in karting history books. 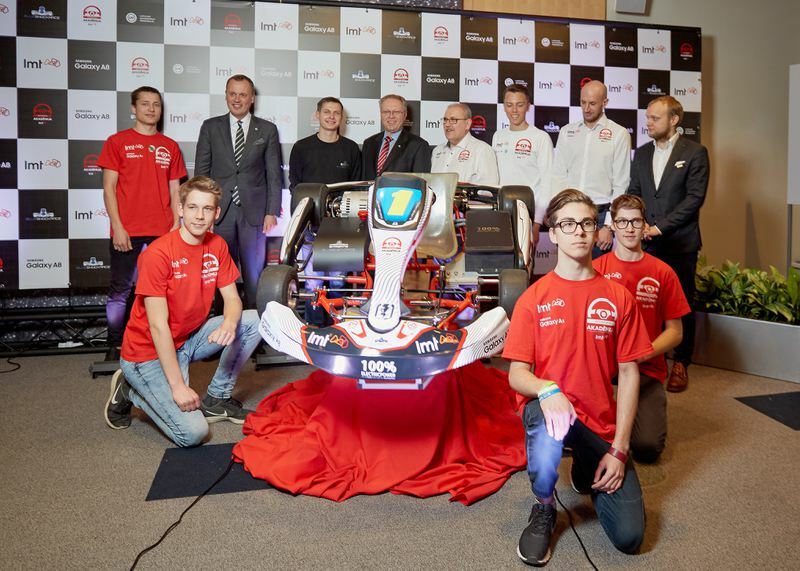 Within the framework of the Latvian Championship and in a completely separate class, the 2018 season, the first electronic karting will be on the track. So this is a completely new record in the history of Latvia, as we will be the first country in the world to host the Electric Karting Championship. In cooperation with the LMT Auosport Academy karting school cup, it is planned that 10 kartings will start in this class in the 2018 season, as well as 4-5 private athletes. It is planned to name the following TeK classes. Currently, it is known from the technical regulations that karting will be equipped with 15kW engines, the total weight will be no less than 175 kg and athletes starting at the age of 12 will start the class. The TOK class racing format will be the same as for other championship classes, with a reduced distance only. In the framework of the Pro-Kart cup, a free class (TeK Open) is also planned to be opened in order to enable Estonian and Lithuanian athletes who have been participating in various club competitions for a number of years, as well as enthusiasts who want to build electric kartings for enthusiasts. At the press conference we heard a lot of phrases such as "development", "growth", "future". The head of the LMT Autosport Academy, Dainars Dambergs, emphasized that electro cars are not only the future of the modern automotive industry, but also the future of motor sports. He also repeatedly stressed that we can be truly proud of such a growth step in our country. It is also very significant that this project will launch its realization on the life or the track just this year when celebrating the centenary of the Latvian state. "You will learn to drive today, but to steer it - all the life," said Andis Geižāns, head of the Office of the Minister of Education, and he can’t disagree with him. Karting is and remains the foundation of all the basics in motor racing, but it does not prevent it from developing and introducing various innovations. Technology is evolving, and the motor industry should follow it. And sport, especially in Latvia, is this sector, which leaves new traces in development. The new and talented athlete Mārtiņš Sesks and the Parliamentary Secretary of the Ministry of Transport, Edgars Tavars both emphasized the important role of karting and motor racing in road traffic. From the first meters in karting, person becomes not only a good athlete but also a safe road user. All this would not be possible without the most important – electro karting. "We have repeatedly proven ourselves as the first electromobiles. With electro-karting it is possible to drive in virtually any weather, even in -20 degrees and even in +40 degrees, it also does not disturb rain pads. All power supplies are in line with European Commission standards and even more secure. On our part, we will conduct a 100% assessment of the electrical system and give a technical opinion before all the matches, so that all pilots on the starting line have the same technique. In all stages of the race we will have service parks, battery charging stations, consultations and technical support. This championship is "open", which means that anyone can participate in the purchase of the equipment, "says Artis Daugins, Head of the Blue Shock Race factory. The head of the LAF Karting commission, Valdis Brutāns, emphasized that this stage in the autosport is very interesting and it is not really clear how long it will be, as the speed of technological development is enormous. Therefore, it seems that electro-karting can be a step between internal combustion engines and motorsports in the computer game format. Emphasizing the above, we invite everyone to enjoy the coming season and face new challenges in technology and development, but retaining their knowledge and talent as a base. The first race, at which we will see an electric card at the start of the season, will be the opening season - 01.05. Within the Kandava Dome Cup. tūristu galamērķis. 5.Daudzgadīga Golfs dalības pakete 6.A V.I.P.